Garden De Lage Oorsprong is alive, and offers something for everyone. Garden lovers can stroll through and admire the garden, art enthusiasts will be pleased to find the garden hosts various temporary exhibitions, and food lovers can enjoy a drink with a delicious pastry or small quiche in our garden view cafe. Our labyrinth with its waving grass and Verbena provides space for reflection. When the berries in the berry orchard are ripe, young and old can pick a box full, while beautiful bouquets can be picked in the adjacent flower picking garden. At the pond and the watercourse with its small waterfalls, children can play with miniature wooden boats. 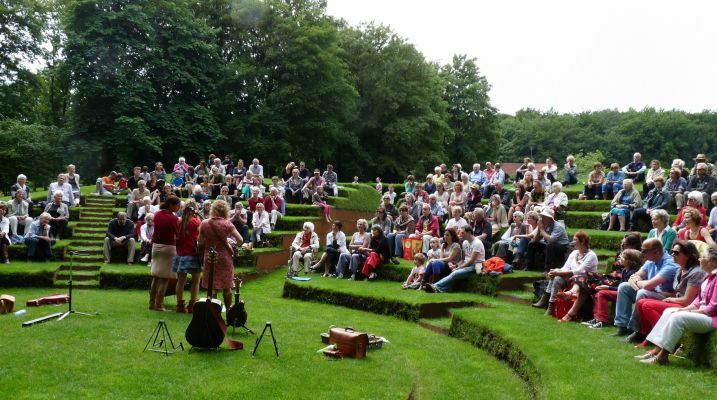 On Sunday afternoons, many come to visit the garden programme which offers musical performances and stirring stories in the green amphitheatre that has a beautiful view over the creek in the valley below. 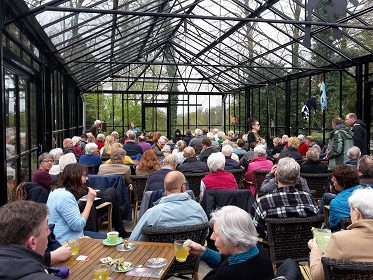 When the weather doesn’t permit us to sit outside, the performances are held in our cosy greenhouse. In 2008, the gate to Garden De Lage Oorsprong was reopened again after the little paradise that estate “De Lage Oorsprong“ once was, had seriously fallen into disrepair. Since then, the garden has been restored with much love and dedication, and has been made accessible to the public. Based on the original garden design by Springer from 1918, landscape architect Ron Pfeiffer created a reconstruction and redevelopment plan. There are five gardenrooms in different atmospheres, a walled Mediterranean garden and an impressive berceau designed by Luc van Dam with wisteria and roses. Jacqueline van der Kloet provided the beautiful planting plan. The end result offers the perfect backdrop for a photoshoot! The development of the garden continues. In the summer of 2017, the vintage garden greenhouse was built, and in the autumn of that year the cedar barn was realised, covered completely with red cedar shingles. 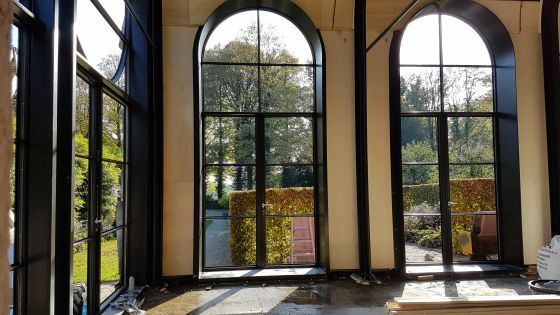 In early April 2019, just before the opening of the garden season, the orangery will be ready. Gert Grosfeld of GSG Architects has made the special designs for the cedar barn and orangery. 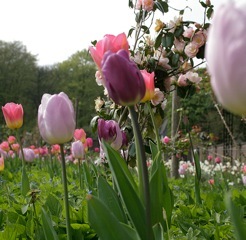 Garden De Lage Oorsprong is open from mid-April to the end of September. During this period you are welcome to visit the garden without appointment on Wednesday, Saturday and Sunday afternoon from 1 pm to 5 pm. Outside the regular opening hours, the garden can be visited by appointment for groups of at least 10 people. The entrance fee is € 5.50 per person. Garden friends and children up to 12 years old pay no fee. An additional contribution is required for attending an activity of the garden programme, unless stated otherwise. Only visiting the garden without attending the garden programme is of course also possible. A free year subscription is possible for owners of a “Gelrepass”. For attending an event we still ask a small surcharge. During your visit to the garden you can enjoy food and drinks in our 'tearoom'. Our pastries and quiches are delicious! When the weather is nice you can sit outside on the terrace, and otherwise you’re very welcome inside the orangery. We also sell honey and delicious berry jam from our own garden, for you to enjoy at home. Picking berries, flowers and playing with boats! 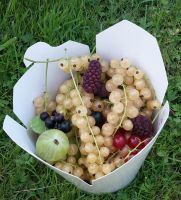 Depending on the season, you can pick various types of berries (€ 4 p.p.) in our berry orchard. Or pick your own bouquet (€ 6 p.p.) in our lovely flower garden. Children can play with boats in the pond and watercourse, or explore the garden driving a small car. On request, the garden is also accessible outside the regular opening hours for groups of at least 10 people. A great option for garden clubs or other nature lovers, or when you want to host an event. Whether you’re saying goodbye to your work, or have a birthday or something else to celebrate, we’d be happy to cater to your needs. The garden is also a wonderful location for your wedding ceremony - and for a photoshoot. On request we can also provide a beautiful lunch or high tea in the garden. The caterer we work with uses organic food and drinks where possible, from suppliers in the area. A visit to the garden with guided tour, rounded off with food and drinks (for example tea and apple pie) could be a nice option. We ask € 25 per guide for a group of up to 15 people. We can deploy more tour guides for larger groups. 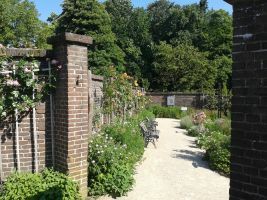 The foundation behind Garden De Lage Oorsprong aims to ‘restore and redesign the garden, making it attractive to people, opening up the garden to the public and managing the garden of the De Lage Oorsprong estate in Oosterbeek sustainably'. The foundation is recognized as a General Benefit Institution (ANBI) and is a non-profit organization. Should the garden make a profit in the long run, then it is stipulated in our statutes that the profit will go to a national good cause. 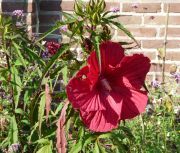 The residents of the old gardener's house, Mariëlle Kempen and Egbert Reerink, have developed the plans to revitalize the garden in 2004. The board of the foundation consists of Richard Engelaar (chairman), Gijs Schot (treasurer) and Els Koot (general member). Mariëlle Kempen (director) runs all daily operations. All of these people contribute as unpaid volunteers. The garden is maintained by Frans Groothuizen, our part-time garden manager, together with over 50 volunteers who work in the garden team, as hostess or as a tour guide. These people also work as unpaid volunteers. Paul Tirion is ambassador for the garden. 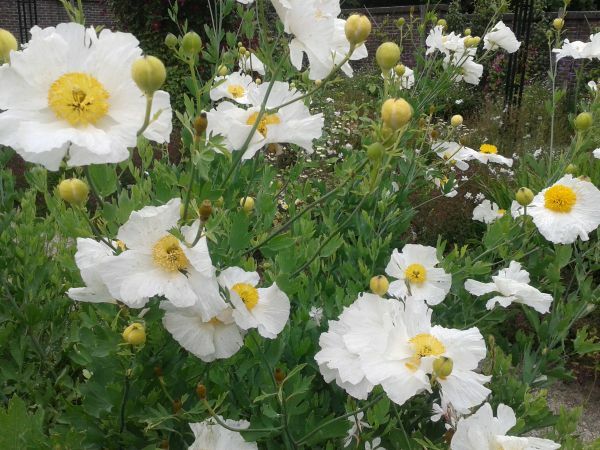 A business friend involved from the beginning is De Kempenaer Advocaten, who have been closely involved in taking any legal 'bumps' in the development of the garden. The office continues to support the garden with legal advice. On Wednesdays and Saturdays there is enough parking space around the garden. Two cars can stand in front of our garden gate, and 100 meters north of the garden there is a parking space just inside the forest. On Sundays it can be busy just before the start of an event, between 2.30 pm and 3 pm. As there is only limited parking space near the garden, we kindly ask you to follow the instructions of our traffic controllers. Within walking distance there is a big parking space at Pluryn, and for busses there is enough parking space along the Rhine or the Westerbouwing. The driver can always drop passengers off in front of the gate and then put the car away. An outline map for parking can help you on your way. Click for a detailed print version of the route description when you come by car, bicycle, public transport or on foot.